This staple part of the British Sunday roast was traditionally served before the main dinner as a cheap way of filling tummies before moving on to the more expensive meat and vegetables. 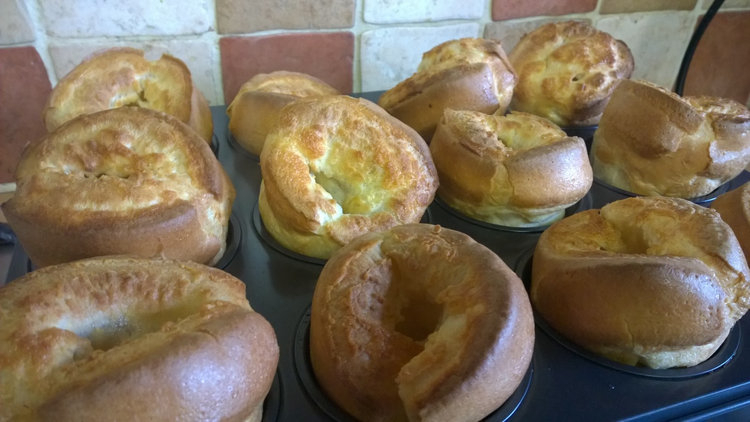 Yorkshire puddings, or variations on them, are eaten around the world, Americans have their own version called popovers which are often eaten with sweet toppings, or served with meat like we do. The basic recipe is of course very simple, but getting it right so that they rise well isn’t as straightforward. There is general consensus that the batter needs to be cold and the fat needs to be very hot, but beyond that, there are differences of opinion on the proportions of ingredients and methods for preparation. I’ve tried different ways over the years, with varying success, but I have now perfected the method that consistently works best for me. The batter came half way up inside those muffin tins, and you can see how much they’ve risen up above that. 1. Whisk eggs and egg white together with an electric whisk for one minute. 2. Add flour a couple of tablespoons at a time whisking in between. 3. Add milk, whisk for another minute. Pour the batter into a jug and leave in the fridge until you’re ready to use. 4. Put a little oil and/or meat fat drippings into the bottom of a 12 hole muffin tin. Place into a hot oven 230C/450F for about 10 minutes. 5. Remove the muffin tin from the oven and quickly pour the batter into the muffin holes, about half way up each one, and put it back into the oven straight away. 6. Leave to cook for about 20 minutes until well risen and golden brown. It’s really important not to open the oven while they are cooking. This can be inconvenient if you want to get your meat out 10 minutes before serving to leave it to rest and carve, so if you have a separate small oven, cook the Yorkshires in there instead. You can actually cook these ahead of time and freeze them once cooked. They can then be reheated in a hot oven for about 4 minutes from frozen. They’re not quite as nice as freshly made, but they’re still pretty good that way! So that’s how genuine British Yorkshire pudding is supposed to be made! This friend of mine who cooked a lot when I was growing up had a recipe and made Yorkshire pudding, but it wasn’t like that at all. She made a pot roast in the oven and then dropped the batter directly into the pan around the roast when it was pretty much done. That’s really more like a dumpling, I guess. But it was really good! And popovers were something I heard about but have never eaten. This isn’t the most traditional method, certainly not in the way I’ve made the batter, generally the eggs aren’t whisked separately first, they’re beaten into the flour, but this way works best for me! The traditional cooking method involved the meat being cooked on a rack in the oven, and the fat was collected in a tray underneath, and the batter would be poured into that tray underneath, so perhaps your friend’s method yielded similar results to that. Cooking individual ones is a more recent way of doing it, but a lot of people still prefer to make one big one and cut it into wedges. I’ve always wondered what Yorkshire Pudding was. Now I know. This looks quite simple to make. I’ll definitely give it a try. Thanks! Then whisk first I shall! I have never attempted this Vanessa but they look scrumptious! Not for me, but if that’s what rocks your boat, I’m sure it would be enhanced by Yorkshire Puddings on the side! I’m not too keen on tofu generally, although there’s a restaurant chain over here called Wagamama (not sure if you have it there), and I’ve had tofu there, as one of many different bits in big bowls of broth, and really enjoyed it, so I guess it’s all in the preparation! No we don’t have it in Calgary but even for me tofu is best in small pieces within a larger dish. Do I mean floats your boat rather than rocks your boat? Well as long as it does something for your boat anyway! I haven’t enjoyed Yorkshire Pudding in y.e.a.r.s. Ouch! I have a feeling I’ve done something like that before, but I can’t remember the exact incident – it’s the type of thing I WOULD do anyway! I never felt so stupid in my whole life. DUH! These look perfect! My mum swears that the secret is getting the oil in the muffin tins really smoking hot so that the batter rises really quickly! Yep, definitely, if the oil isn’t hot hot hot they won’t rise! These look so easy and so yummy, Vanessa. I will have to try them! Yes it’s funny, they’re one of those things which in theory are really simple, but sometimes they just don’t rise even though you think you did exactly the same as last time! This method seems a bit more foolproof (although these could very well fail on me sometime too!). One of my favorite childhood meals is roast and Yorkshire pudding that my dad made. He is from England, so he pretty much prepared it the way you do. I have made it too, but still can’t beat my dads recipe. Oh yes I forgot you had that English connection. I wondered after I published this post, and seeing that a couple of commenters hadn’t really been sure what they were, whether some people might think you have them on the side, like bread, rather than actually on the plate with the meat and veg and gravy!